The American Club of Brussels invites you for an evening of fun, socializing and chatting! Our Final Friday event has become one of the best-known mixers in Brussels. Everyone is welcome! The cash bar is open to all. 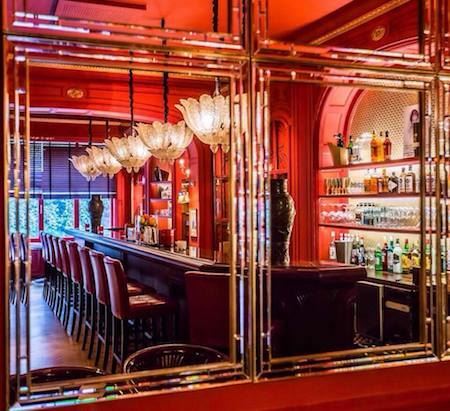 What's the story behind Alice Cocktail Bar & Rouge Tomate? Alex Joseph comes from Sebastopol in California. After honing his craft under the guidance of world class chefs Douglas Keane (Cyrus**, San Francisco) and Daniel Humm (Eleven Madison Park***, New York City), in 2009 he joined Rouge Tomate Brussels to lead the kitchen as Executive Chef. In 2015 Alex won the title of ‘San Pellegrino Best Young Chef’ for the Benelux region, and he was voted fourth best young chef in the world at the international final in Milan. Alex Joseph and Thierry Naoum are the owners of Rouge Tomate Brussels – with Alex in charge of the kitchen and Thierry taking care of management, together they lead the restaurant with rigour and passion. Eager to excite the taste buds of every visitor, Alex has surrounded himself with a cosmopolitan team of creative and dynamic young chefs. Together, they share a love for quality produce, refinement and contemporary cuisine. Our monthly Final Fridays are a great opportunity to mingle and socialize with new and old friends in Brussels in a fun and relaxing environment. So bring your friends! All are welcome! See you there!